Concentrate on collecting top quality antique Limoges porcelain and you will always profit in the long term. Antiques collectors have known for a very long time that Limoges is the definition of quality porcelain. 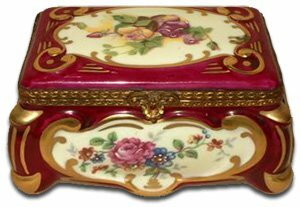 Serious collectors know that Limoges specialise in trinket boxes and that those little boxes are worth more than almost anything that could fit inside them. Antique Limoges porcelain is considered the finest hard paste porcelain in the world because of three very specific characteristics. The first being the essential ingredients used in creating Limoges porcelain are all local natural ingredients, kaolin, feldspar & quartz. Then the intense firing process that forms the superb glaze that cannot be penetrated by the elements and gives Limoges porcelain that exquisite translucence. Finally, an abundance of skilled artists and the French flair for aristic design set a standard that other Europeans and American porcelain producers struggle to emulate. So, if your grandchild has just lost her first tooth or received his first haircut. How do you commemorate such a momentous event? Believe it or not, you’ll find an exquisite Limoges porcelain trinket box designed especially to memorialize those first strands of snipped hair, or that first lost tooth. If Limoges went so far as to design a mini container for these, you can bet you’ll find one that will fit any need you have. It didn’t take me long to find something that could commemorate just about any holiday, major life event, and collectible category (mini hats, shoes and bags, for example). Even the women from the Moulin Rouge have been spun off into a Limoges collectible. They’re represented in the form of a tiny, hinged porcelain mini trinket box. But antique Limoges porcelain covers much more than trinket boxes. You will hear the name come up time and time again at a typical antiques auction, so if you find you’re getting hooked on the beauty of the collectible limoges boxes I am focusing on here, take a look at their other creations, all highly collectible and sought after. But it’s more than just the look that makes antique Limoges porcelain collectible. The history behind it, and the current manufacturing process certainly play a role, adding to the mystique and individuality of the pieces. Limoges, a French city southwest of Paris, predates Roman times. 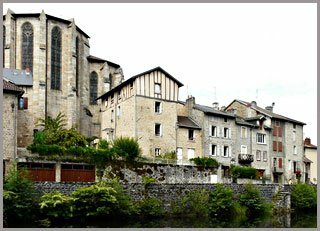 Its physical placement, directly on the river Vienne, makes Limoges an easy, accessible stop; one that would even be called necessary in those early years when journeys were more arduous than enjoyable. Though porcelain reigns there now, during the Middle Ages, Limoges enamels were all the rage, but that trend declined substantially by the end of the Middle Ages. Unlike many American towns which found themselves dependent on one industry to fuel the economy, an industry that dried up for one reason or another, the artisans of Limoges didn’t simply curl up and die because the trends had changed. Luckily they caught a break. 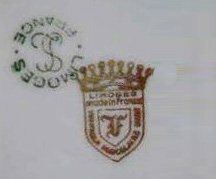 Limoges built its first porcelain factory a mere six years after the initial find of the kaolin. The kaolin is combined with pulverized feldspar and quartz. Then a fine process of milling, pulverizing, heating, molding and firing begins. Europeans consider this product porcelain only if it retains a translucent quality. Every piece can not meet the rigorous standards. Many crack or break during the process and must be discarded. 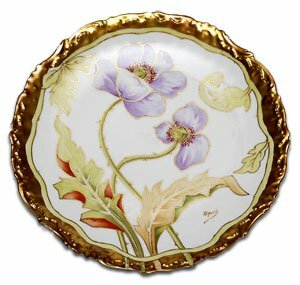 What sets antique limoges porcelain apart from other ceramic forms may be considered a technicality, but a necessary one to the creators of this art form. Pottery will absorb water. Conversely, even if porcelain has been chipped or cracked it will not retain water. Nonetheless, chipped or cracks items have to go. They won’t meet the Limoges quality standards. The end result of creating the Limoges porcelain piece is just the beginning of the process. 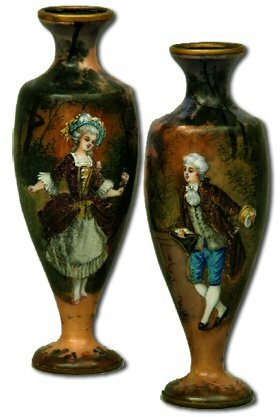 The shape is there, but an artisan then has to decorate the individual object, add tiny hinges if needed, to any one of the figurines, pill boxes or other porcelain product you’ll find bearing the Limoges porcelain marks. Once the artist completes his or her work using the special paints used on porcelain, the product goes through another firing process. This long production process is what makes Limoges porcelain collectible. By the end of the process, like snowflakes, no two products will turn out the same. So when a collector speaks of having a one-of-a-kind item, this will be the truth. The real boost to Limoges Porcelain production came when royalty gave its seal of approval. Shortly after the first Limoges factory was established, Louis XVI bought it. For a time, production was still limited due to restrictions on the production of porcelain products. The French Revolution brought an end to these restrictions and Limoges flourished in the wake. Once again, its physical placement played a huge role: a mixture of its proximity to the essential ingredients, as well as its general accessibility by land or water. Moreover, the city was lucky enough to have a grand forest in Limousin, which could supply the extensive amounts of wood needed to fire the kilns used in the production of antique Limoges porcelain. 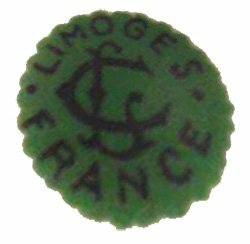 On all counts, Limoges proved the ideal spot. Workers flocked to the town, and by 1819, four porcelain factories graced the land. By 1861, this would increase again to 27 factories, supporting some 3,166 workers. Limoges had a stronghold on the French porcelain market but didn’t really start to take over the American scene until around 1855. It was an Limoges native who made that happen. It was during the 1870s that Limoges finally perfected its porcelain process, and the items produced then are considered to be some of the finest antique Limoges porcelain ever made. David Haviland who had come to Limoges from New York in 1842 in search of porcelain to import to the United States, got the ball rolling. He knew the beauty of the product and the marketability, as his own family had emigrated from Limoges. By 1855, the demand for porcelain from Limoges in the United States called for Haviland to construct his own factory in the town. By the late 1850’s, sales in the United States accounted for around half of the antique limoges porcelain being manufactured in the city. 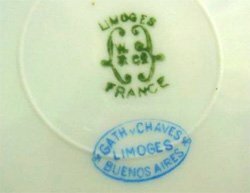 Given the extent to which Limoges now depended on the United States for its sales, it naturally suffered a major blow during the Civil War when exports to the United States were curtailed, then halted entirely. It had to scramble to pick up export business to other countries, which eventually helped a little. Collecting Antique Limoges Porcelain can be very rewarding if you know what you are looking for. 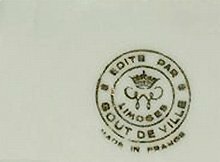 Today, Limoges Porcelain marks carry a designation by the French government. 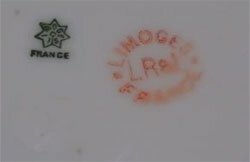 So, when you see a piece of limoges porcelain, the mark you see is not from a particular studio. It may come from one of many studios in the region that choose to use the standardized Limoges porcelain marks. And that’s natural given that the elements (including the traces of soil) needed to produce these delicate creations can be found only in Limoges, France. 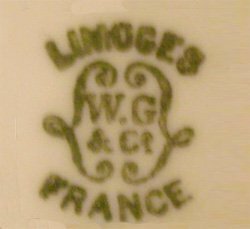 It’s no wonder that with all of this creative talent behind the name, Limoges spawned its own museum, Musee de Limoges, in 1845. The museum features some 11,000 pieces, though not all porcelain. It’s also quite believeable that the pieces have been presented to heads of state over the years; from the tsars of Russia to kings and queens of Europe. So, it’s not very surprising that we covet it nowadays. If a piece of antique limoges porcelain is good enough for a king or queen, it must be something worth having, right? Since the early 1990s hundreds of Limoges reproductions have flooded the antiques market. The quality of the porcelain and the decoration is far below the quality of genuine Limoges porcelain produced at the Limoges factories in France. And some of this inferior porcelain bears pseudo Limoges porcelain marks and they are being offered as Limoges or Limoges China. 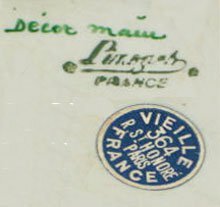 The most common marks are T&V Limoges France, Limoges China, ROC, and ROC LIMOGES CHINA. ROC is short for Republic of China. 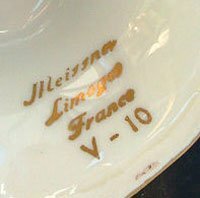 There are several factors that can contribute to the value of a piece of Limoges porcelain … the factory where it was produced; the limoges porcelain mark; how old it is; the condition; how complete a set is; the quality of the decoration and the artist’s signature. You’ll have an easy time finding genuine pieces, as a simple Internet search yields dozens of shops carrying all styles and ages of Limoges porcelain. In fact, the tough part may be in choosing and displaying them, rather than finding them. Oddly enough, I’ve also seen pieces at jewelry and gem shows for very reasonable prices, and I’ve paid less than $50-60 for some limoges trinket boxes. The pieces I’ve seen online sell for around $140+, not including auctions which may be better deals. I’ve also found Limoges trinket boxes in consignment shops, but I rarely see just one of them. The shop owner who spots these and sees the potential generally stocks quite a few. And if they don’t have it in, they can get it, so ask for a catalogue. At the very least, use online venues to give you an idea of the many things on the market. 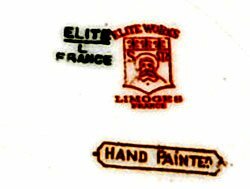 At one website alone, I found 24 versions of the Eiffel Tower in the Limoges pillbox format. If you can envision it, Limoges has cast it in porcelain. Just make sure you verify the Limoges porcelain marks.